If you have any questions or suggestions you are welcome to join our forum discussion about Two Attempts for a Shift in Market Movement. We know that market’s movement is rarely straightforward, and if it is, that move usually does not last long. The market is often shifting its direction and along the way is reaching levels that act as support or resistance and halt its movement after which often a second attempt follows. In general, the market is regularly trying to do something twice, and if it fails both times, it usually attempts to do the opposite. This counts both for with-trend and counter-trend moves. A trend line break is the beginning of a new leg in the other direction. Every time when either bulls or bears lose temporary control over the market or a new trend is beginning, there will commonly be a two-legged move. A two-legged move occurs every time when market players agree that a move is strong enough to ensure that a test will be needed before it becomes clear where the market will head next. If the momentum of the first leg after a reversal (basically a counter-trend move, because the new trend has not been confirmed yet) is strong enough, it will cause both bulls and bears to speculate whether the move was the beginning of a series of legs that would form a new trend. Because of that, both counterparts will anticipate that a test of the old (still current) trend’s extreme will fail, and the with-trend traders will lock in profits as the price approaches it, instead of adding to their positions. Picture yourself a long bear trend. If there is a decisive move up after the bear trend and the move extends above the moving average and the last lower high of the bear trend, traders will expect that on its way back down, the price will test a low that will hold above the bear trend’s low. Once the up-move (first leg) loses momentum, longs will lock in profits, while shorts will enter, thinking that bears are still able to hold control of the market. Because the bulls have exited the market and are waiting for more bullish price action, while bears are shorting, the price will retreat. As it drops, bulls begin to return to the market, while new bears will look to quickly exit so that they don’t score losses, which will push the market up, thus, forming a higher low – just like in the following example. You can see that the market made a two-bar reversal and penetrated the 14-day EMA (first leg), after which it retreated back, forming a higher low. Bears will be reluctant to sell again, unless the second move up (second leg) fails to exceed the top of the first leg and instead rebounds from its resistance level, forming a double top bear flag. If it breaks above it, then there is a good chance that the trend has reversed, but if not – bulls will be quick to exit at that level and bears will short aggressively, having understood the second leg up has failed. As we’ve said in previous chapters, perfect signals are rarely seen, and two-legged moves are not an exception. 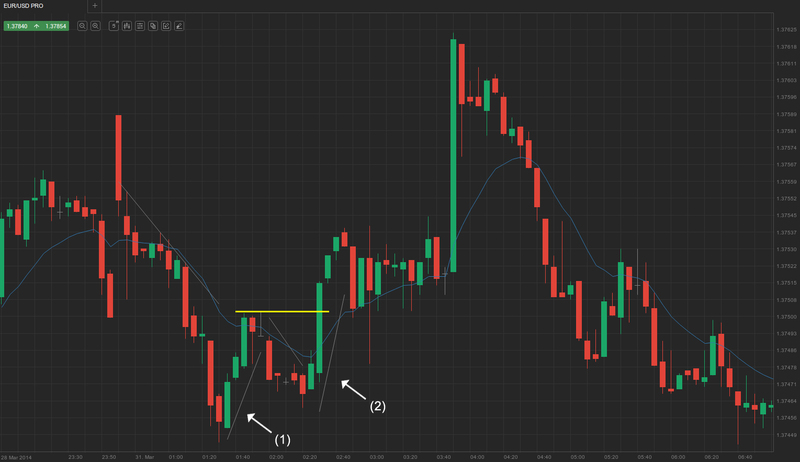 Sometimes the move will form over many bars (10-20 and more), which will be harder to see on the chart. Switching on a higher time frame will surely make the pattern clearer, but wasting your time scouting higher time frames for a pattern that will occur only once or twice per day is time-consuming, and will cause you to miss other good entry points on the normal time frame you use. Sometimes a two-legged pattern will actually be a three-legged pattern, if the first push was not decisive enough to resemble an end of a trend. Usually, when you have a double top or double bottom, the first move signifies an attempt for a trend change and the second move is a test of that level, where the price rebounded. If it breaks it, then the market movement usually shifts in that direction, but if it fails again to penetrate that price level, then the market will likely pull back. However, when the first move is not decisive enough to be rendered as an attempt to end the current trend, the market will often test it with a two-legged pattern. If both legs are above the previous move’s high, then it becomes a three-legged pattern. You can also have a three-push pattern when one of the two legs is made up of two separate legs. This is quite often seen in three-push patterns, but when you take a closer look you will see that the leg with the two smaller components has often quite similar properties compared to the second single move. Practice makes perfect and being able to distinguish such variations takes some time to learn. We’ve said previously that traders should be in their comfort zone so if you don’t feel confident enough to make this trade, you should just hold back and wait for the next one. It will surely come eventually.